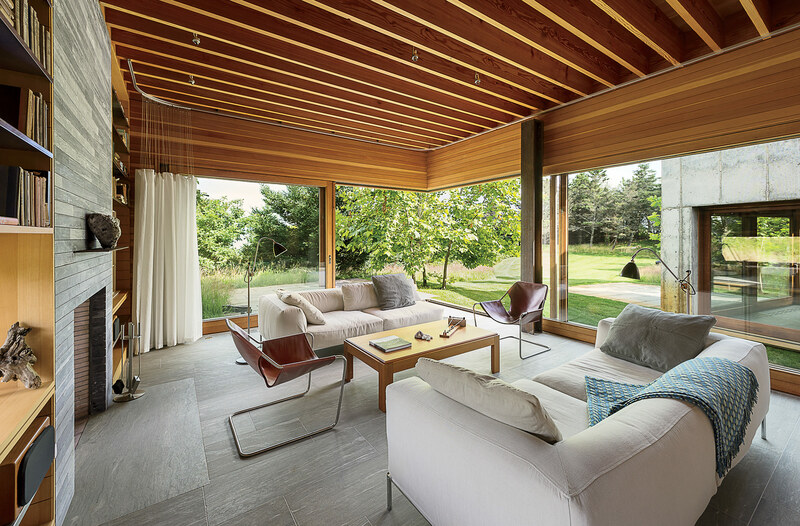 Expanses of glass and Spanish cedar window frames bring lightness to this concrete box home in Martha's Vineyard. A 592-square-foot prefab by Danish industrial company Vipp features a jaw-dropping glass-enclosed living area. A getaway on Oregon’s rugged coast makes the most of its beachfront location with floor-to-ceiling glass. In Carmel, a renovation adds an expansive jewel-box pavilion with uninterrupted 360-degree views atop a midcentury residence. A detached garage on Vashon Island, Washington, was renovated with glass walls to create a luminous modern space fit for entertaining. San Francisco–based lighting designer Terry Ohm’s prefab in the Northern California town Clearlake features glass walls and an extruded aluminum frame. Curtains can create privacy when desired. In Chicago, a modern live/work space captures views of the city through floor-to-ceiling windows from Chicago Tempered Glass set in Tubelite frames. Though glass is most often used on exteriors, it can also work as a take on the interior dividing wall. This glass-enclosed bedroom in a Montreal apartment can be fully covered with a blackout curtain.